Everyone knows that the good seats have the best view. When you install a Simonton Impressions® Bay or Bow window you’re not only bringing the outside in, you’re providing the best seat in the house to see it. 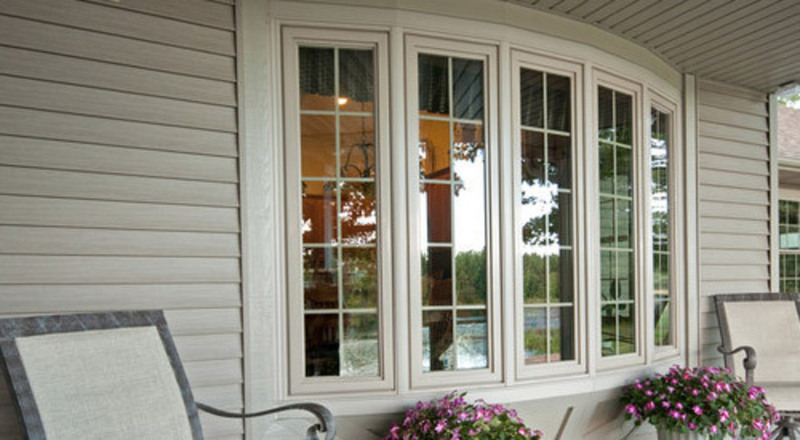 From the strength of the cable support system and the attractive head and seat board to the energy-efficient design features, Simonton Impressions® Bay and Bow windows are the picture of performance. Constructed by mulling three windows together at a 30- or 45- degree angle, with a Picture window as the centerlite, flanked by operable windows. Created by mulling three or more windows at 10-degree increments, Bow windows feature a rounded, more circular effect and shallower head and seat board. • Fusion-welded Construction: Frame and sash are fusion welded for strength and durability. • Multiple-chamber profiles: Vinyl profiles are filled with dead-air chambers that increase window insulation. • Cable Support System: Strong steel cables provide accurate installation and securely hold the Bay or Bow window system. • Contoured Exterior Trim: Solid, vinyl piece creates a weather tight seal along the exterior of the head and seat boards, virtually eliminating air and water penetration. • Exterior Roofing System: Although not offered through Simonton, Bay and Bow windows can be capped with an exterior roofing system. • Power Seal Spacer System: All windows in a Bay or Bow system feature Simonton’s standard true dual, Power Seal Spacer System™, which combines four independent design features to provide a strong, thermally efficient spacer system. The U-channel Intercept® spacer offers low conduction rates and is sealed with a computer applied, durable urethane adhesive which completely seals the area where the glass touches the spacer. The hot melt butyl along the bottom is a superior moisture barrier, while the desiccant matrix absorbs virtually all moisture within the insulating glass unit. • Sensor Glass®: In addition to standard Low E/Argon-filled glass and double-strength glass panes, this optional glass package adds the remarkable Super Spacer® solid silicone foam spacer for the ultimate energy efficiency. • Specialty Grids: Between-the-glass grids allow easy cleaning, while providing a distinctive accent for your home. From flat and sculptured grids to assorted grid patterns and the elegant V-Grove style glass, a wide range of options helps you create the look you want. • Specialty Glass: The benefits of specialty glass are varied – some provide increased safety, energy efficiency and privacy, while others add a stylish touch that will make your home unique. • Warranty: Simonton Impressions® windows and doors are backed by a Double-lifetime Limited Warranty that can be transferred by the original property owner to the following owner of the home. The comprehensive warranty covers the vinyl, hardware, screens, glass units and labor. Celebrating 70 years in business, we’re a full service window and glass company serving the North Bay and beyond. • We proudly feature Simonton brand windows and doors as well as most other major brands. • Were experts at repairing single and dual pane windows and patio doors as well as installing commercial store fronts and door closers. • We install framed and frameless tub and shower enclosures in standard and heavy glass and perform all routine glazing including table tops, mirrors, shelves, and decorative glass. • We do a huge amount of business in security screen doors, new window and patio door screens and re-screening. Naturally, we provide free estimates and all work is performed by trained technicians who are all California Glass employees. • We are one of Vallejo’s oldest businesses and hold one of Northern California’s oldest contactors licenses. These two facts speak volumes about our reputation for quality service and fair prices and we encourage consumers to consider this when making a purchase decision. Copyright ©2019 California Glass. All Rights Reserved.